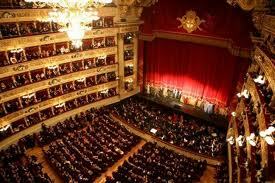 Italy has many beautiful, historic opera houses: the majority of them still works as theaters. Opera addict can’t but visit at least one opera house once they get to Italy and enjoy a fantastic live performance. For example, out there there is an incredible “bargain” for all that love opera and Milan! This year and for the very first time, the tickets for the first night of the opera season at La Scala (traditionally reserved for the city administrators and politicians and also for national and international personalities and celebrities) now are already on sale to the general audience. So everybody can access “la Prima” at Teatro Alla Scala, which is Milan’s famous opera house, and also one of the Italian most famous theatre. This particular event (that is, La Prima) has always been an occasion for showing off, but also for protests by animal lovers against fur coats. Just a few words on what happened in the recent years: La Scala was bombed during World War II in 1946 it has been opened again and quickly the theatre took back its reputation as top Italian opera house. La Scala opened again in December 2004 after an extensive and intense renovation. Inside you will find a lovely bookshop, a bar and an interesting history museum, too. The original opera house has been designed by the neoclassical architect Giuseppe Piermarini, and it was opened in 1778: many famous operas were first performed here in Milan in this particular location. The first performance of the season this year it will be Don Giovanni on 7 December. Swedish baritone Peter Mattei is going to sing the title role in the Mozart’s best-known opera: drama and pleasure, meaning masterpiece! You can’t miss it if you are a true “melomane” (opera fan)! So together with la Madunina check it out the opportunity of grabbing thi one-life occasion and sit in La Scala for the first performance of the entire season! Tickets are available from €840 to €2,400. This entry was posted on Tuesday, November 22nd, 2011 at 3:17 pm	and is filed under Events in Italy. You can follow any responses to this entry through the RSS 2.0 feed. You can leave a response, or trackback from your own site.